When you spend your hard-earned money on things, you want them to last. Leather is a product that will provide you with years of service and use if you treat it correctly. Simple maintenance can help you get the most miles out of your leather (think: cars - they need regular oil changes, routine maintenance, and washing and waxing helps the exterior look tons betters). Whether you purchased a new leather good from us, or are curious about trying to make the most of one you’ve got, these steps will help anyone who wants to keep their leather pieces lasting and usable for years to come. Pre-step: For those working on their boots: Remove laces. You’ll need to get them out of the way so you can fully access the tongue of the boot. Dust off any visible dirt. If you don’t, it’s just going to make a bigger, muddier mess. If you have a soft bristle brush, you can use here, though you can get by just fine without one. 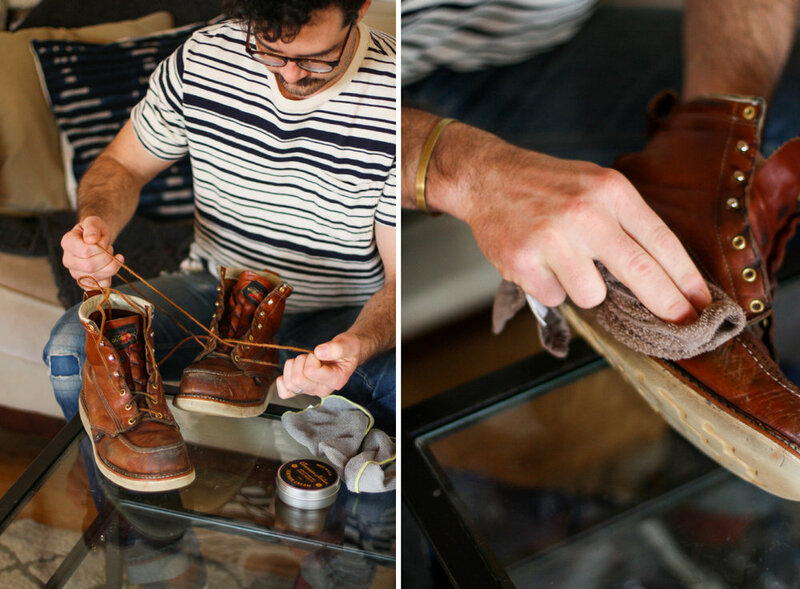 (PS - If you feel your boots are extra dirty and soiled, you may want to use a pH balanced leather cleaner to give them a good, overall cleaning). Use a soft, damp cloth (dampened with warm water will be just fine), and wipe leather item all over, removing grime, dust and particles. Your leather will be visibly damp at this point, so make sure to allow for drying, naturally. Do not try to use excessive heat or drying to speed up the process – this can damage your leather and potentially lead to harmful cracking or shrinking. Once the leather is dry, condition with a leather cream or conditioner. Our Leather Cream is a wonderful, natural product that restores and protects (made of food-grade seed oils and beeswax, our leather cream offers excellent moisturizing and waterproofing abilities). As long as you have a natural product, you can apply the cream or conditioner by hand. We found that the natural warmness of hands/fingers will help soften any harder, solid-based conditioners and allow for easier application. (Please note: a cream or conditioner may leave the leather darker than original, so it may be best to do a small test in an inconspicuous area first if you’re afraid of a visual change.) Give the leather a generous coating, and then allow to dry. An hour after conditioning, you may want to use a clean rag and wipe the leather all over, ensuring no excess conditioner is hanging around. The leather will be a bit darker when a conditioner is first applied, but the tone will usually even out with time and use. You’re set! As you’re off to your next adventure you can rest assured that your leather will be along for the ride and ready for the life that’s about to be thrown at it! If you take care of it on the regular, it’ll take care of you. Note: Depending on wear and condition, you may only need to use our leather conditioner every 6 months. For heavier wear and abuse, you may want to use more frequently. Get your Leather Cream here!